The Coalition Government's pension cuts threaten the future retirement of every trade unionist and worker.In response, the TUC Congress has called a day of action on 30 November in response. This is a great opportunity for everyone to stand up for their pension rights, from the public to the private sector. Ten public sector unions representing three million workers are balloting and preparing to strike against attacks on their pension schemes, This will be the biggest industrial action since the 1926 General Strike, and the best opportunity that trade unionists will have to protect pensions. If you are being balloted, vote yes! If you have questions on the pension cuts, you can contact your union or Leeds against the cuts for info and to find out what's planned for the day. The government is trying to divide supposedly "gold plated" public sector workers from private sector workers. It's true that private sector pensions have been slashed over the years – but we need to level them back up, not have a race to the bottom. Behind its divide and rule rhetoric, the government is attacking everyone's pension, hiking retirement age and changing to a fraudulently low CPI measure of inflation. This will slash the value of everyone's future retirement – public sector or private sector, and all those who rely on the state pension. In a Britain where the rich are getting mega-rich and everyone else getting poorer, there's plenty of money to fund a decent retirement, housing, health service and benefits. 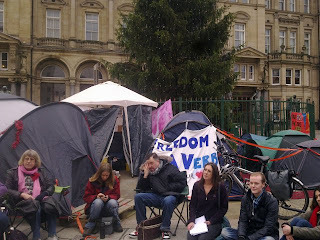 Everyone relies on a pension, and everyone has a stake in this movement and can be involved. Let's make 30 November a massive turnout against the government's attack, building mass support for the strikers among other trade unionists, workers, pensioners, and students, and demand all the pension cuts are dropped. 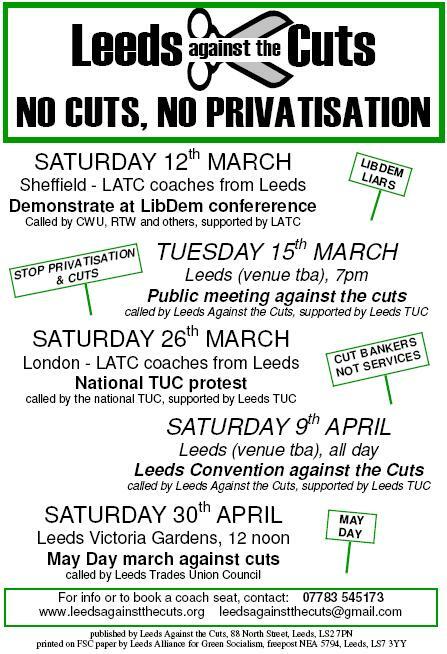 Leeds Against the Cuts is backed by the Leeds Trades Council.